What are business electricity bills and how can you reduce them? Your business electricity bills are presented to you at the end of a given billing period. Electricity bills can provide your business with a range of useful information that can help you to understand your charges and aid you in the search for a better business energy deal. How is your business electricity bill calculated? These figures can often be found on the back of your bill if you needed to make the calculations yourself or to double check the amount that you are being billed for. Most simply pay their business electricity bill without reviewing the range of valuable information that they have been given. This is a BIG MISTAKE! One of the easiest ways to discover whether you could save money on your business electricity is to check through your bill for a section that informs you of better deals that you can pursue with the same supplier. It’s now a legal requirement for energy suppliers to inform you of when you could be saving money on their tariffs, therefore it’s always worth having a read through your business electricity bill to see if there’s any hidden gems! WARNING: This does not mean that you will be placed on the cheapest or best business electricity tariff in the UK energy market – It is simply the best option that your current supplier is offering you. 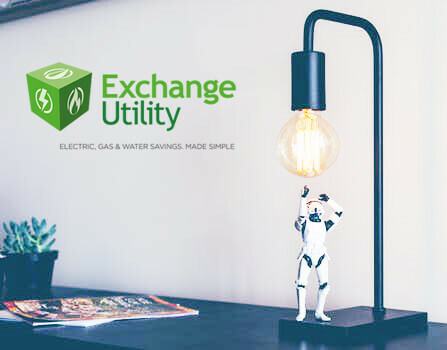 With Exchange Utility, you can benefit from superior buying power and great rates, so compare business electricity tariffs with us to discover if you can find a better deal with your current supplier or other UK energy providers. If you are keen to implement energy efficiency measures at your business then you can monitor your progress by checking the energy consumption figures that are shown on your business electricity bill. If you are implementing energy efficiency measures well, you should soon see your electricity consumption fall – along with the cost of your business electricity. Now that Smart Meters have been introduced, some suppliers even offer a breakdown to show you where you use the most energy. E.g. lighting, heating or appliances. If you are lucky enough to have this, then you can easily identify which areas to make more energy efficient first, meaning that you can make a bigger impact, sooner! Review your business energy options with Exchange Utility: Our experts are trained specifically to help you to reduce one of the biggest commercial overheads. They can advise you on the tariff most suited to your business operations and save you up to 40% on your bill spend.